Prior to 1933, the dollar referred to a unit of gold that had a weight of 23.22 grains. Since there are 480 grains in one ounce, this means that ‘dollar’ also stood for 0.048 ounce of gold. This meant that one ounce of gold referred to $20.67. The present floating exchange-rate system is a by-product of the Bretton Woods system of fixed currency rates of exchange, which was in operation between 1944 to 1971. Within the Bretton Woods system, the dollar served as the international reserve currency upon which all other currencies could pyramid their money and credit. The dollar, in turn, was linked to gold at $35 per ounce. Despite this, only foreign governments and central banks could redeem their dollars for gold. 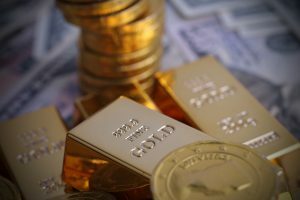 The growing margin between the market price of gold and the official $35 per ounce created enormous profit opportunity, which some European central banks decided to exercise by demanding the US central bank to redeem dollars for gold. The link between the dollar and gold was cut in August 1971. In order to save the bankrupt system, policy makers have allowed a freely floating standard. While in the Bretton Woods system, the dollar had some link to gold, and all the other currencies were based on the dollar. All that is now gone, and there are no more limitations on money printing. So if a country takes advantage and depreciates its currency by means of a relatively looser monetary stance, other countries may try to do the same. Consequently, the emergence of competitive devaluations is a sure way of destroying the market economy and plunging the world into crisis.